Regenerative Real Estate Breakfast – National Realty Club, Inc.
Regenerative real estate is about impact investing for the bottom line AND for making a difference in our communities. This NRC event will have a brief keynote speech followed by table discussion groups. Each table will have a specific discussion leader and topic described below. We are very excited to bring our members and stakeholders this event in this format. Seating is limited so register now to ensure your place at what will be a very informative program. Andrew Foley is Associate Director of Development at Jonathan Rose Companies, a leading developer and investor of green, affordable and mixed-income housing. Since 1989, the firm has completed over $2.5 billion of work and is one of the largest owners and operators of affordable housing in the country, with over 15,000 units in 18 states. Andrew oversees early stage predevelopment activities for the company and is currently working on projects in New York City, Washington DC, and Detroit. Mickey has worked with her family real estate business since she was a small child; her mom had a tiny hard hat made for her for sight tours. Her paternal grandfather was the first to enter the business and her father Richard, started building his portfolio as a teenager. Mickey received her bachelors and masters in Accounting from Stern School of Business and her law Degree from Fordham. She took a lot of classes at Fordham on the subject of working with government entities and property law. She works in the staffing industry specifically focusing on real estate placements while continuing to work for her real estate focused family office and family foundation, The Jacob & Anita Penzer Family Foundation. Her family invests in real estate, primarily in NYC, but what really brings them together is their passion for poverty alleviation, particularly in the NYC area. Her passion is to use her lifelong real estate experience, combined with her knowledge of social services, government, philanthropy and social entrepreneurship to create socially conscious real estate projects. She wants to holistically redesign what it looks like to live in a low income community. This passion is what inspired her to start the regenerative real Estate event series and she is excited to partner with NRC on this event. Let’s Build a better world together! Richard D. Baron is co-founder and chairman of McCormack Baron Salazar, a leading urban real-estate development company focusing on revitalizing neighborhoods throughout the United States. The firm, founded in 1973, redevelops blighted areas and areas of concentrated poverty into economically-integrated communities. The firm has been closely involved in the formation of the Department of Housing and Urban Development’s HOPE VI and Choice Neighborhood Programs and, under those programs, has revitalized over 30 former public housing sites into thriving, economically-integrated, safe communities. The firm has also received allocations of New Markets Tax Credits, which have been used for economic development, provision of social services, healthy food initiatives, educational investments and job creation in revitalizing communities. 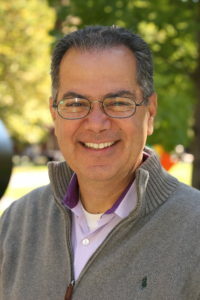 In addition to his leadership of McCormack Baron Salazar, Mr. Baron was the co-founder and co-chairman of the Vashon Education Compact, a partnership of the St. Louis Public Schools and major corporations, and he is the founder and developer of The Center of Creative Arts (COCA), in University City, Missouri. In 2003, he established the Center for Urban Redevelopment Excellence at the University of Pennsylvania. In October 2004, Richard Baron received The Urban Land Institute J.C. Nichols Prize for Visionaries in Urban Development. The Nichols Prize was established by the Nichols family in 2000 to recognize individuals whose career has demonstrated a commitment to the highest standards of responsible community and real estate development. Mr. Baron is a graduate of Oberlin College and holds a master’s degree in political science from the University of California-Berkeley, and a Juris Doctorate from the University of Michigan. He has been awarded honorary degrees from Oberlin College and St. Louis University and received the Medal of Achievement Award from the University of Pennsylvania – Penn Design. Craig founded Avid Realty Partners in 2014 to deploy capital intelligently across Multifamily Apartments, Hotels, and other Commercial Realty assets. Avid buys existing assets and develops new construction projects. Here, Craig leads all property sourcing, underwriting, capital fundraising, development activities, and oversees all asset management and operational oversight. Avid has acquired more than 600 apartment and hotel units in the past couple years, and expects to acquire additional properties in coming months. Before founding Avid Realty, Craig spent more than a decade as a highly acclaimed semiconductor sell-side equity research analyst for firms like Smith Barney Citigroup and FBR Capital Markets. Here, he serviced leading hedge and mutual fund clients, won several awards, and was one of CNBC’s go-to semiconductor market experts with over 75 TV appearances (see CNBC footage here). Craig has consulted for technology startups in market strategy, outsourced CFO, and capital raising roles. He has been an Angel Investor in various startups like Thirstie.com, BioIQ, and Revenue.com. Earlier in his career, Craig worked at Intel Corp. (1999-2002) in the CPU finance group closing the books, helping drive forecasting cycles, and working to maximize cash return metrics. Throughout his career, Craig has been focused on creating value and delivering stellar results for Customers, Investors, Employees, and other stakeholders. Topic: Eliminating barriers to entrepreneurship by combining affordable work/live communities with comprehensive business development services. Avi Telyas is an American real estate developer, serial entrepreneur and pioneer in lean manufacturing and construction. His passion for architecture and craft entrepreneurship led him to found Makerhoods©, an organization which advocates for urban land use policies that foster self-employment by building affordable working and living space in economically challenged areas. Mr. Telyas is a 1986 graduate of the Harvard Business School, a former trustee of Pratt Institute and a Principal of Seaview Development where he has worked for over 30 years running complex projects and operations. He embarked on his own entrepreneurial career in 1986 by acquiring a small manufacturer based in New York City while still a Business School student and proceeded to grow the business through its’ eventual sale to The Parker Hannifin Corporation. His accomplishments were recognized as runner-up for the Harvard Business School Club of NY, Entrepreneur-of-the-Year Award in 1999 and chronicled in an episode of Managing with Lou Dobbs on CNN as well as a Harvard Business School Cases Study and a featured article in the Wall Street Journal. The Makerhoods© program brings together Mr. Telyas’ life-long interest in entrepreneurship and urban development. He continues to advocate for urban planning and design that encourage affordable entrepreneurship and lowers the barriers that working families experience in their quest for a middle class income. In 2015 he introduced the Makerhood© concept to a worldwide audience in a TEDx presentation in Jersey City, and in 2017 Mr. Telyas delivered the Keynote address at the Governor’s Conference on Housing and Economic Development in Atlantic City, New Jersey. Mr. Telyas devotes his free time to pro-bono consulting for various charitable and nonprofit organization it the metropolitan area such as Grameen Bank, a micro-loan innovator targeting low-income entrepreneurs and Urban Pathways, a developer of supportive housing. Elliot Glassman is an Associate and Technical Principal with Built Ecology, WSP’s high performance and sustainability group. He is also a charter member of WSP’s global computational design group WSPnext. Elliot obtained his Bachelors of Architecture from the New Jersey Institute of Technology and a Masters of Design Studies in Sustainable Design from the Harvard Graduate School of Design. In 12 years of combined professional practice as an architect and sustainability consultant, Elliot has worked on various projects around the world, each requiring a unique response to a diverse set of climatic, site, and programmatic conditions. Elliot’s main area of focus is combining computational design techniques with performance simulation to inform the design process. These computational techniques help identify integrated design solutions that improve the performance of the built environment in areas such as energy, daylight, renewable energy, and thermal and visual comfort. Regenerative real estate is about impact investing for the bottom line AND for making a difference in our communities.